Is Mount Marcy, the highest peak in New York, the Queen of the Adirondacks, for you? Located in the Adirondacks High Peaks region, Mount Marcy, at 5'344 ft, is the highest peak in New York state, and the 6th highest in the North East, a list topped by Mount Washington at 6'288. Mount Katahdin, in Maine, is just after at 5'268 ft. In addition to be one of the highest peaks, it's also one of the most remote as it lies well over 6.8 miles (11km) from the nearest trailhead. The summit can be reached from almost all directions; the most popular trail (and shortest, even though all is relative) is the Van Hoevenberg starting at the Adirondack loj, then back the same way for a distance of about 15 miles (24 km), and an elevation of a little more than 3,000 ft (900 ft) between the trail head and the summit. 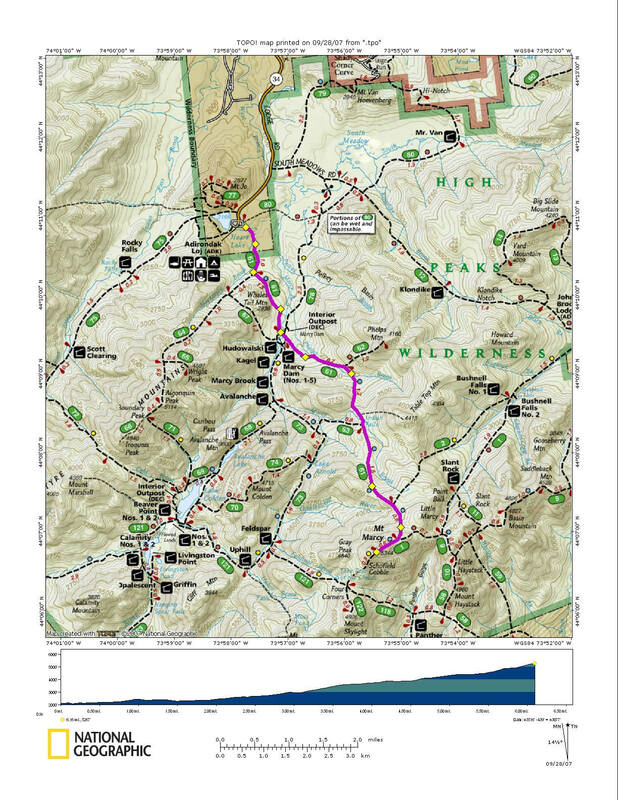 Even though all trails are clearly marked, don't forget a map; high peaks maps can be very general, so the best is to print this more localized map by the National Geographic. The same trail leads to other popular peaks, such as Phelps, Table top, on the way up to Marcy, Gray and and Skylight to the South of it, and Algonquin and Iroquois to the west; for this reason, the parking lot at Adirondak loj can be very crowded - in the summer you should arrive before 7:30am to get a spot. Don't forget to sign in before you start the hike! (our advice ... put the time as well, you will thank us). The Adirondak loj, maintained by the Adirondack Mountain club (ADK), offers many type of accommodations, from bunk beds, to cabins on Heart lake, to camp sites and lean-to's. Like the parking lot, they fill up quickly so plan in advance, or find a room in nearby Lake Placid (20-30 min drive) where you will find anything from a motel, to the Lake Placid Lodge, relais et Chateaux, or the renovated Lake House. Despite or because of all those impressive numbers, the hike is very popular in summer time and during foliage season. The weather pattern and wind speed are not as drastic and impressive as Mt Washington, but wind of 40 to 75 miles an hour are not unheard of, so come prepared. In all cases, the old Adirondack adage applies - if you do not like the weather, just wait 10 minutes and it will change. The hike terrain goes from a first gentled forested section till the Marcy Dam, to a more challenging, still wooded, but very rocky trail up to the tree line, and then the final section above the tree line to the summit, where cairns will give you direction. The Marcy Dam was built in the 1930's but by 2020 it will have disappeared. Heavily damaged by hurricane Irene in 2011, the New York State Department of Environmental Conservation (NYSDEC) estimated it to be too expensive to be rebuilt and is taking it down slowly but surely. This decision flows with the definition of the Adirondacks park, where "the principles of wilderness management include allowing rivers and streams to flow unfettered and to minimize human-made structures." Marcy Dam is a favorite spot to get a head start on the hike and sleep over. Wether you are a camper, or using one of the few lean-to's, remember that this is black bear area and plan accordingly. Once you leave the Marcy Dam, the trail becomes more challenging, or to put it in simple terms ... it's the start of the rocks, small and large, and it will never stop. Gone is the smooth forested path as you start your climb, westbound, to the summit. Very quickly you will start seeing the other peaks surrounding you and realize why you have stepped on so many rocks. There are not that many peaks from which you can see 43 of the 46 peaks above 4'000 feet in the Adirondacks (if you want to know more, or join the select few who have climbed all of them, you can join the ADK46ers group). In the clear sky day, the ranges create blue waves one after the other, more ethereal as you look in the distance, especially toward Vermont and New Hampshire to the East. Once you cross the tree line, you enter a totally different growing environment, the Alpine zone, and its delicate balance of lichen and flowers that have adapted and grown here for over 10,000 years. 250 feet above the three line, the summit offers itself, looking like a bold head. Like many of the great peaks, Mount Marcy has suffered of its popularity. Don't be fooled by the bold spot, it's actually a rich growing environment for arctic vegetation. Notice the rocks that surround the gravel areas; they are put in place by the Summit Stewards to define the regrowth spots; stay on the solid rock to help the process. You can help build the rock enclosures by bringing rocks (just one is enough) from the bottom of the mountain. Deposit it on top at the indicated spot and the Stewards will take care of it. One rule to remember, above the tree line, do the rock walk ... stay on the solid rock. Come June, the tiny wild flowers are blooming; the alpine plants may have only a 60 day growing period, but it takes year of invisible tenacity for them to take hold and grow again. The summit steward program was established in the 1990's by the ADK; don't hesitate to ask them any question, from the name of each summit, to the trail to go back, or the vegetation, they are happy to help. Enjoy the view, and help the summit get to its past splendor by staying on the designated areas. Most people will go back to the Loj just using the trail used to go up. The more adventurous, and ready for a few more miles, will actually take the trail that starts on the left of the summit cairn and goes directly down. Considered very steep, the trail will take you to the tree line in no time. The main reason to take this trail back, apart from the thrill of going down fast, is to see Lake Tear of the Clouds. This little lake is the highest pond in the state, but more importantly is considered the highest source of the Hudson river, even though the river itself is not named such for several miles. It will humble you to consider that this pond becomes the majestic Hudson river that goes under the Verrazano bridge. The trail will go through swamp areas, which you will cross thanks to wood planks, some older than others, some more stable than others, but all crossing beautiful sceneries. Then you can't avoid some more rocks on the trails as you go up 500 ft toward lake Arnold (which you will pass without seeing) before finishing the loop and reaching the Marcy Dam. A couple more miles and you are at the Adirondack Loj. In all, when back at the trailhead, you will have done about 18 miles (30km) using this trail. Remember, we told you to sign in before starting the hike? Time to sign out! It's the only time you will see a line to sign out and you will thank us you put your time in (much easier to find your name). Summiting Mount Marcy is not for everyone, but as a popular hike, with many options, it gives the opportunity to push yourself as others will cross your path.